This post is part of my personal challenge to bake my way through all the challenges of the Great British Bake Off. 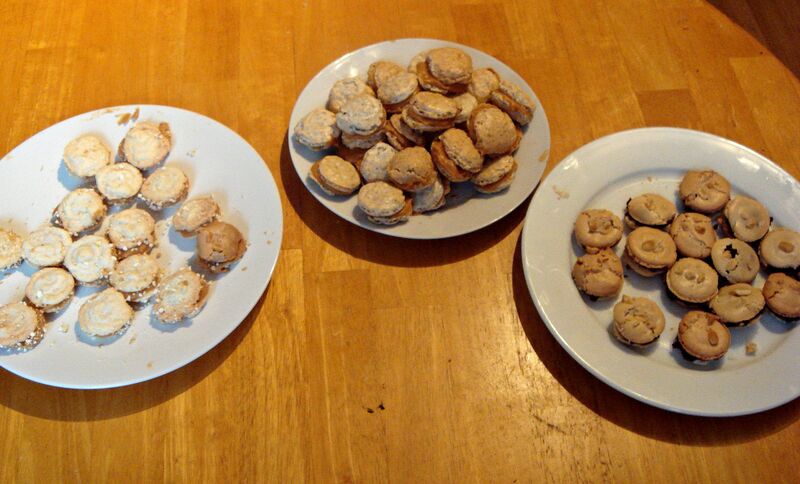 The challenge below is the showstopper challenge for week four (biscuits week) of series two: make three flavours of macarons, twenty sandwiched macarons per flavour, for a total of sixty pairs (i.e. 40 shells per flavour, a total of 120 shells). There was a veritable fashion, some years ago, for food bloggers to write about conquering the mighty mountain of macaron baking. The challenges were epic, the trials and misfortunes of misshapen batches amply documented and the subsequent triumphalist posts, full of tips and tweaks on how to make perfect macarons, were long and technical. That time – of refined and elegant biscuit, of brutal perfectionism – is now past. Blogging and foodie tastes now run to the simple, the artisanal, the rustic, the thrown together. No less delicious than the delicate refinements of the macaron but also no less stylised and no less of a statement. What it says about the world as it is could be anyone’s guess – does the hankering for the handmade, rough and ready baked goods signify a desire for security and a rejection of the trappings of materialism at a time of global austerity signified by the ornately fussed and primped-over patisserie tray? I’m no social anthropologist. All I know is that I am relatively relaxed about macarons, for the simple reason that I find them very difficult to make. If they bake all the way through and don’t stick stubbornly to the baking sheet, I’m pretty satisfied. My macarons may resemble cottage cheese to some – lumpy and bumpy – but I’m happy to have something more than a scrap of crisp shell and a handful of (almond) dust beneath, to be honest. This post is part of my personal challenge to bake my way through all the challenges of the Great British Bake Off. 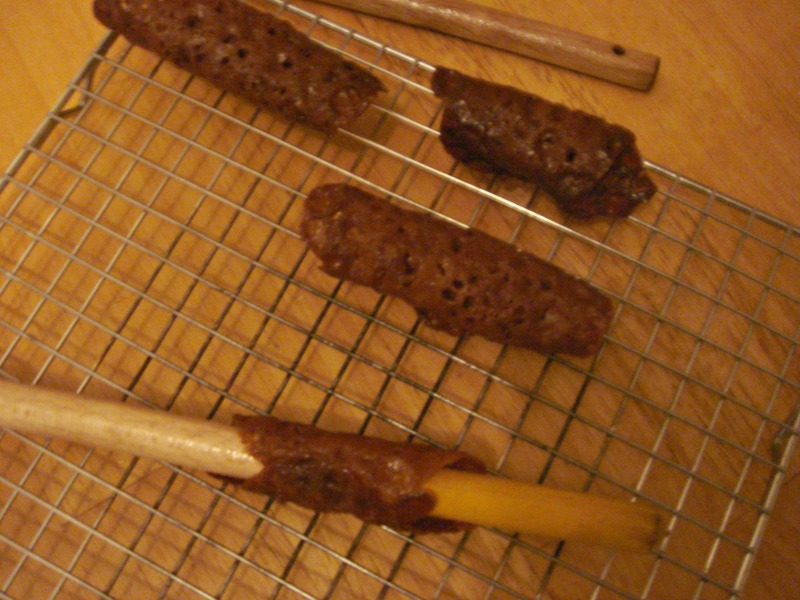 The challenge below is the technical challenge for week four (biscuits week) of series two: brandy snaps. So I completed the technical challenge a while ago. What’s a while, you may ask. 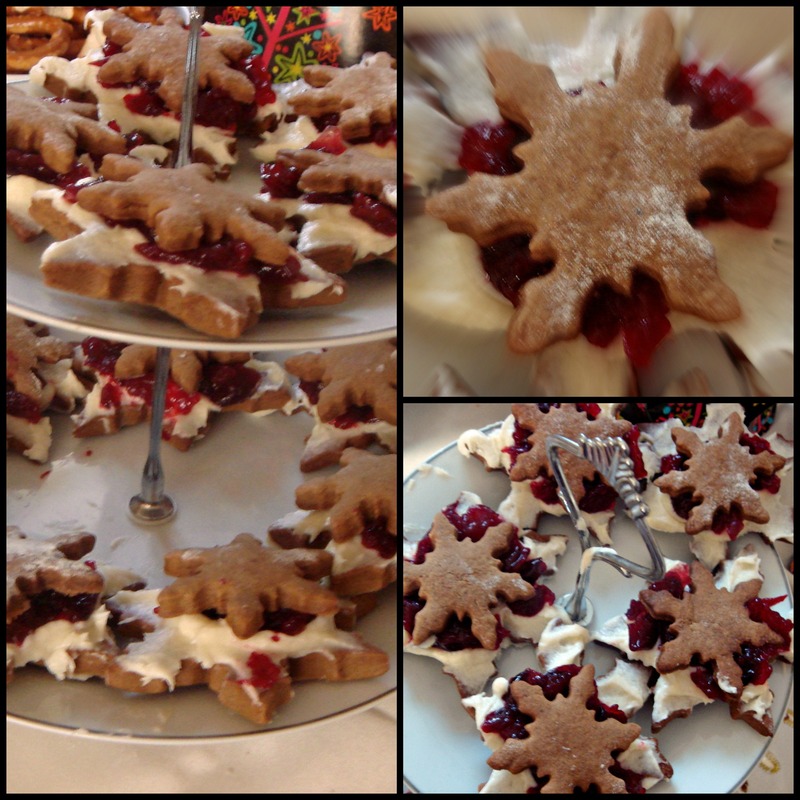 Well, I made these on Christmas Eve, while watching Skyfall with my boyfriend. Skyfall was amazing, if – as someone living in London – somewhat chilling, especially the chase scenes in the Underground. And yes, I have checked, and it would have been possible for James Bond to make the jump onto the back of that Tube train. If, you know, monumentally risky. Don’t try this at home. Anyway, baking and rapidly revising one’s estimation of the Bond genre simulataneously is quite the juggle! 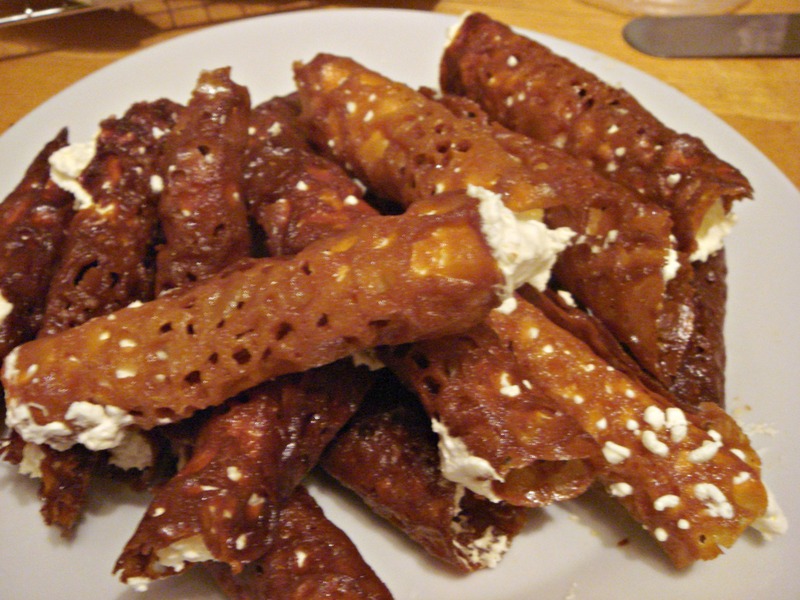 And these brandy snaps were by no means perfect. The idea was to have twelve perfectly evenly-sized, lacy, delicate biscuits, shaped into loops, around a fatty, contrasting cream filling. Instead, I think my initial dropping mixture was too thick and they were all different sizes and very thick; the fine honeycomb lacing was more like chunky crochet. However, considering my dislike of fiddle and faff – something I am having to rapidly overcome with this baking challenge – I don’t think it was a terrible first effort. Doubtless Mary and Paul would have disagreed and sent me to the bottom of the row. I also think they were a little too dark – but actually I liked that darkness, the depth of caramelly flavour the extra baking time imparted. I can’t say I wouldn’t do it again. I’m a bit behind on posting up my progress on my personal baking challenge. For the final challenge for the series one challenges, I baked up a tea party’s worth of treats for some friends, which we enjoyed in my sun-dappled flat sometime in July. In the meantime I’ve been on holiday and when I returned it was raining heavily. However, a tea party in the rain could be just as good. Especially as, when I made everything, it was extremely hot and actually a little uncomfortable to bake so much. However, it did mean the bread rose incredibly fast. The final challenge (and also Finals challenge) for the first series of the Great British Bake Off was to make brown and white bread for sandwiches; a miniature pastry; and scones, all coming together in a traditional afternoon tea. I made cucumber and ham and cheese sandwiches, using Nigella Lawson’s recipes for bread; chocolate meringue tartlets; and maple scones (a North American twist on a British invention to be sure). The maple scones were the standout hit; when I baked them, my friend exclaimed “what is this amazing smell filling the room?” With so many baked goods, there were leftovers, which tasted fine the next day, even the scones. Series four of the Great British Bake-off is now showing, and I caught up on the first episode yesterday (I was away when it first aired) (also, some spoilers below). I was surprised at how simple the first challenges were after the technically demanding and complex challenges of series three (sandwich cake, angel food cake, chocolate cake for series four, versus upside down cake, rum baba and hidden design cake in series three). Maybe the show wants to go a bit more ‘back to basics’? Or maybe they were running out of ideas for challenges – there is, perhaps, a limit on how you can challenge people with cake. Still, despite the simplicity, there were quite a few screw-ups as people struggled under the challenge of time pressure, cameras and (probably) little sleep. Paul was up to his usual antics, and if anything seemed to be playing up to type more than ever: he criticised the concept of a grapefruit cake (why? grapefruit is delicious!) and then said “annoyingly, I really like that”, which is a line he pulled when judging a bacon, peanut butter and chocolate pie for the American Baking Competition, the US version of GBBO. The space engineer who was Star Baker was amazing: the chocolate cigarettes he made looked stunning. Finally I close the second episode’s set of challenges for my baking challenge exercise. The showstopper challenge for biscuit week of season one of the Great British Bake-Off was to create a delectable trio of petit fours, namely meringues, macarons and something choux pastry-based. Because I am a normal person I actually staggered the cooking of these. It was a shame I couldn’t have people round and serve them beautifully together, but…I didn’t. A pity, because I do love the look of those generous piled-up petit four trays.